The Most Realistic Ice Hockey Uniform & Jersey Template, Super Editable, Built in 3D, with Reflections, Shadows, Cleanly Separated. Does this work on affinity photo? Close, but you missed a few things. 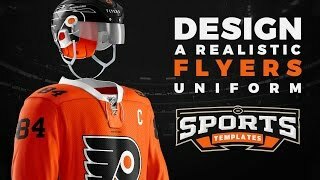 In general, this doesn’t match anything that the Flyers have worn, but it most closely resembles the 2014-2017 alternates which were derived from the 2012 Winter Classic jerseys. The stripes on the sleeve should be B-O-W-O-B with a thick W stripe instead of B-O-B. Same on the socks. The jersey number should have a thick white border. The bottom jersey stripes are coordinated correctly, but the bottom stripe should be thicker than the top and all the stripes should wrap around the back. The helmet side logos should be much smaller and there should be a player number across the front of the helmet in white with an orange border. The captain’s patch is black inside a stylized crest. Finally, across the entire kit, white should be changed to cream. I appreciate what you’re doing here and it’s a great tutorial, regardless of its accuracy. Thank you for this, just an idea. Goalie masks? Where do I get the NHL fonts that are used? Is photoshop the only program needed to run this template? Finally, hockey!!! Does this work in Elements? Idk what Flyers jersey you were trying to make here but nevertheless this jersey template is incredible. The multiple collar options are EXCELLENT, and exactly what I was hoping to see! The shoulders don’t have similar layout options in this video, it seems. As most shoulder yoke designs are rounded on the ends (not squared off like this example), or have piping accents, I’m hoping that the currently available templates give more flexibility than just squared edges. These are excellent templates otherwise, but design freedom is key and the shoulders are a big part of setting a team look. If the options are there, I’m sold!